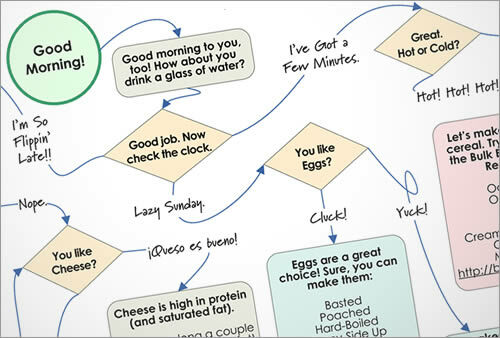 All you need to do to get my breakfast flowchart is sign up for my email list. Just enter your name & email address in the form below, confirm your subscription, and you’ll get the PDF. Thanks! Overwhelmed by the amount of work that must go into your terrific posts! Any idea where I might find low-sodium cottage cheese? I really miss it on our “loso” eating plan…Thanks! Thanks, Liz! I’d bet that Whole Foods carries some lower-sodium cottage cheese; but I’m not sure (and it would probably depend on your local store’s buyer, too — doesn’t hurt to ask them to stock it, though!). 2) Does making your own waffles count in the pancakes section? 3) How can you have breakfast without a nice cup of coffee? Yes, waffles are synonymous with pancakes (nutritionally speaking, of course)… Unless you insist on filling every little pocket with syrup? Amazing! You really put a lot of effort into this and not only is it really clever but the info is really important. Breakfast is the most important meal of the day and you’ve just given everyone the blueprint for hundreds of healthy breakfast combos. Thanks!! I was a chronic no breakfast girl – but I’ve changed that little by little. Can’t read it? Anything I can fix on my end? how can we zoom?? or make it bigger?? Make sure you’ve downloaded the PDF — use the link at the end of the post. Great Post! Loving all your worksheets. I can’t believe you sit there and make them. I’m printing this one for my sister and parents. A breakfast we love in our house is boiled eggs coarsely mashed with avocado and a sprinkle of salt and pepper. The geek in me (which, I’ll admit, is pretty significant) has a blast putting these together. I don’t think I’ve had boiled eggs+avocado mashed together. I’ll have to try that. (Two of my favorite foods; how could I go wrong?). I think I forgot to add Avocado as a good toast topping, too… I’ll work that into a revision. Thanks! no prob–glad to help with an idea! avocado makes for such a good fat/butter doesn’t it? i use it sometimes in place of oil in dough for indian breads.